I read this book for the first time a few years back and have re-read it several times since. In the book, he shares tons of valuable business lessons that would benefit any network marketer or small business owner. Overall, I give the book an 8 of 10 and consider it a must read for any serious entrepreneur. These quotes are listed in no particular order. Enjoy. # 1 I can’t learn anything when I’m doing the talking. You have two ears and one mouth for a reason. Use them in the proportion. # 2 What matters is you finish…period. Anyone can start something, and most people do, but finishing what you start is the key to success. # 3 Be like a postage stamp. Stick to it until you get there. Be persistent and consistent. Nothing in life goes exactly as planned. Show up every single day. # 4 Create a habit of learning. Make it a point to learn something new each day. Work harder on yourself than you do on anything else. # 5 Whatever you do is a lot more enjoyable when you do it well. Take pride in what you do and be the best you possible. # 6 Knowledge is only useful when put into action. Ignorance on fire is better than knowledge on ice. # 7 The best way to get them is to get to know them. Never forget that people like to do business with people they like, know and trust. # 8 Success is largely hanging on after others have let go. Hang in there and stay the course until successful. Winners always win and quitters always quit. # 9 The know-it-all invariably has a tough time in sales. Keep an open mind and keep learning. Try to learn something from everyone you talk to. # 10 Humor is a critical business weapon. Have a sense of humor and don’t take yourself too seriously. Learn how to laugh at yourself. # 11 Never accept any proposal immediately, no matter how good it sounds. Always take a few minutes to evaluate any deal, even if it sounds good. This can help keep you from making bad decisions. # 12 It’s a sign of weakness when you lower your own demands without getting your opponent to lower theirs. Learn how to negotiate. # 13 Both sides have to win something, or you don’t have a deal, you have a homicide. Make every deal a win-win for everyone involved. # 14 Don’t let the other side force a deal. Never let someone else pressure you into making a decision. # 15 The most valuable asset any business can have: loyal customers. One loyal customer can be worth millions of dollars to a business, from repeat business and referrals. # 16 Do what you do best. Let somebody else do the rest. Focus on what you are good at and delegate everything else. # 17 It’s not how much it’s worth. It’s how much people are willing to pay. Just because something is appraised or valued at a certain amount doesn’t mean it is worth that much. Something is worth what someone else is willing to pay for it. # 18 Make sure the person you are dealing with has the authority to make a deal. Always work with the decision maker. # 19 We are judged by what we finish, not by what we start. Finish what you start, even after your initial enthusiasm is gone. # 20 Your success does not depend on your product. It depends on how well you know your customers. Your product is not your real business. Taking care of your customers, and knowing what moves them to action, is your real business. # 21 If you can sell, don’t worry about the paperwork. Focus on selling and let someone else help you with the paperwork. # 22 Every good salesperson I’ve ever encountered is driven. You have to want success and want to be the best of the best, to become a top producer. It won’t happen by accident or luck. # 23 Good salespeople don’t sell. They listen. Ask a lot of questions and learn how to listen. That is the key to successful selling. # 24 There are no jobs until someone makes a sale. Selling is the most important job in the universe. # 25 Good performers hate meetings, and the wimps that like them usually can’t sell anything anyway. Top producers want to be out in the field making sales, not sitting in meetings all day long. # 26 The most important relationship you can build with a customer is trust. It takes a long time to build trust and seconds to lose it. # 27 Referrals are the heart and soul of prospecting. Treat your customers and prospects well and always ask for referrals. # 28 It’s not the sale that makes the salesperson. It’s what he or she does to ensure the next sale that makes that person a pro. Anyone can influence someone to buy from them one time, but it takes a professional to convert that person to a loyal, repeat customer. # 29 Some of the highest paid sales pros work for the highest priced vendors. It’s a lot easier to make a lot of money in sales when you sell big ticket items with large commissions. # 30 The planner/plodder wins. The seat-of-the-pants/live-for-the-moment type loses. Plan your work and work your plan. # 31 No sales, no business. Without sales, every business would go under. # 32 Leaders think about empowerment, not control. Empower your team to do great things. Give out your power and it will come back to you ten-fold. # 33 If you expect to get the business, you better know your customer, your product, and your competition before you step onto the playground. Be prepared for every sales call. # 34 Spotting, hiring, and keeping winners is vital. The quality of your people is the most important element in building a successful business. Surround yourself with people more talented than you are. # 35 Leadership requires persuasion. A real leader has influence with others. PERIOD. # 36 Of all the human failings that can destroy a business, arrogance is the deadliest. Check your ego at the door. Be humble and admit when you are wrong. Don’t be a know it all. # 37 You’re lucky if your kids sign your birthday cards. A hand-written note in real ink on real stationary stands out a bit, doesn’t it? Do the little things. The little things matter. # 38 Everybody, and I mean everybody, screws up, hurts others, finds fault, misjudges, and acts emotionally and improperly from time to time at the expense of others. No one is perfect. When you mess up, apologize, and admit you were wrong. # 39 Creative gets the business: account service loses it. How you take care of your customer AFTER the sale is even more important than what you did to get the sale. # 40 If you win, say little. If you lose, say less. Be gracious in your victory and humble in your defeat. 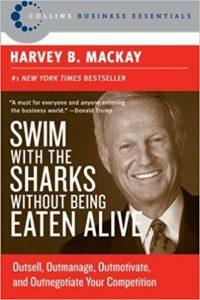 Harvey Mackay is a New York Times Best Selling author. His books have sold more than ten million copies. He is also a well respected speaker, trainer and entrepreneur. His business background is in the envelope business. There you have it folks. 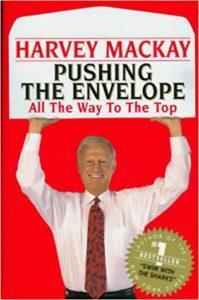 These are my favorite Harvey Mackay quotes from his best-selling book “Pushing the Envelope.” Which quote on here is your favorite and why? Leave a comment below to let me know what you think. I look forward to hearing from you.